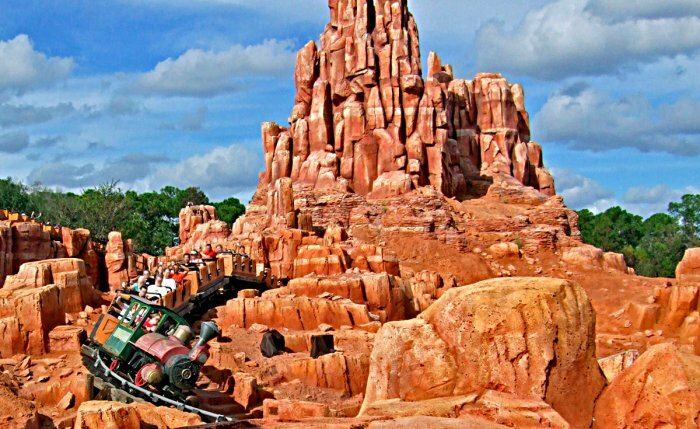 Here we cover the Big Thunder Mountain Railroad speed and the top or max speed for the ride at Walt Disney World Resort’s Magic Kingdom in Bay Lake, Florida (Orlando Area). An overview of the speed and top speed of the ride is discussed. A comparison to the other roller coasters and rides in the park is also covered in this article. The top speed for Big Thunder Mountain Railroad (BTMRR) is 36 miles per hour (mph). Converting this to the metric system, the roller coaster can reach a max speed of up to 57.93 kilometers per hour (kmh or km/h). This is the fastest speed of the attraction. We have also seen that the Big Thunder Mountain Railroad max speed is noted by some places to be 35 mph. We believe that the 36 mph speed may be more accurate, however, the ride’s speed can be in the 30 to 36 mph range. How fast does Big Thunder Mountain Railroad go? Big Thunder Mountain Railroad goes approximatly 36 miles per hour at its fastest speed. The overall speed for Big Thunder Mountain Railroad varies at times, as many roller coasters do. There are a couple of slow points on the ride, as there are 3 different inclines the train climbs. The fast points during the ride occur after the inclines and the speed of the ride is sustained well after the inclines. 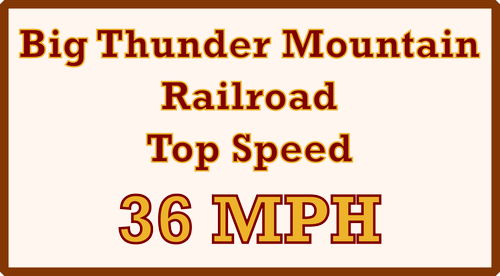 At the fastest point Big Thunder Mountain Railroad goes around 36 mph, as mentioned above. Above Big Thunder Mountain Railroad Speed page photo by simon17964 on Flickr. Photo modified by NavFile. Photo is released under a Creative Commons License. Big Thunder Mountain Railroad is the fastest roller coaster, however, it is not the fastest attraction in the Magic Kingdom. It is faster than Space Mountain, the Seven Dwarfs Mine Train, and The Barnstormer roller coasters. The fastest ride in the Magic Kingdom is Big Thunder Mountain Railroad next door neighbor, Splash Mountain, which reaches a speed of 40 miles per hour during the big drop. Frontierland officially has the fastest rides in the park. If you are looking for fast rides, Frontierland is the place to be. Even though Big Thunder Mountain Railroad is the fastest roller coaster in the Magic Kingdom, it does not have the drops that are “big” like Space Mountain has. The ride also does not have a large drop like it neighboring ride, Splash Mountain, has. This makes the roller coaster less scary and more appealing to a wide range of guests. To learn more about Big Thunder Mountain Railroad (BTMRR) please visit the other pages on the site. You can also learn more about the other attractions in the Magic Kingdom by visiting our Magic Kingdom section.